Other photos: Photo 1, Photo 2, Photo 3, Photo 4, Photo 5, Photo 6, Photo 7, Photo 8, Photo 9, Photo 10, Photo 11, Photo 12, Photo 13, Photo 14, Photo 15, Photo 16, Photo 17, Photo 18, Photo 19, Photo 20, Photo 21, Photo 22, Photo 23, Photo 24, Photo 25, Photo 26, Photo 27, Photo 28, Photo 29, Photo 30, Photo 31, Photo 32, Photo 33, Photo 34, Photo 35, Photo 36, Photo 37, Photo 38, Photo 39, Photo 40, Photo 41, Photo 42, Photo 43, Photo 44, Photo 45, Photo 46, Photo 47, Photo 48. 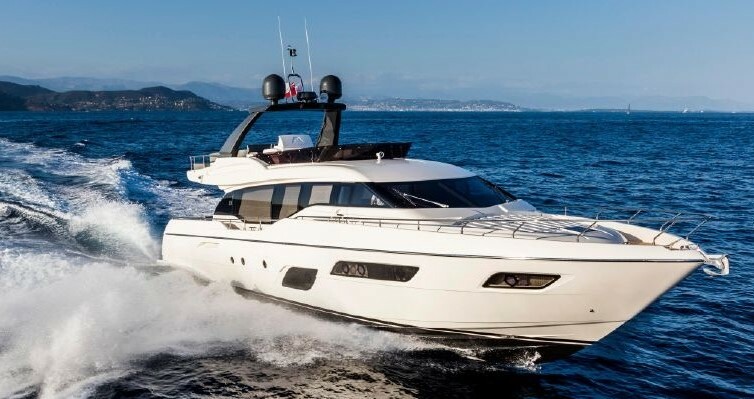 MR. CANCUN is a very clean and well maintained 780 Ferretti offering the best engineering along with the finest Italian design. It is well-kept by an experienced Captain. She is well equipped with recently upgraded Garmin touch screen plotters and lighting upgraded to LED. She is beautifully finished with the Italian attention to detail and an interior layout that is very generous and comfortable. MR. CANCUN is built by Ferretti S.P.A., hull No.16 in this production line. This yacht is a fiberglass, fly bridge motor yacht with a planing hull. There are 4 en suite staterooms plus a 2 cabin/1 head crew quarters aft of the master and forward of the engine room.